Yes … not that there ever really was an “age of privacy”. I’ve always thought that the concept of privacy online was really more of an illusion than reality. When you share private information on any online service, you are trusting that service to keep your information private. The catch is that these companies are run by people; people who make mistakes with your data or people who change their minds about how much of their service should be private or public. There are plenty of examples of online services that have been hacked or employees who carry your private data on unsecured devices where your private data has been compromised. The privacy changes at Facebook have certainly stirred up additional debate about the issue of online privacy, and Marshall’s recent ReadWriteWeb article on the topic is what prompted me to write this post. I’m not going to get into whether what Facebook is doing is right or wrong, since the bigger question about whether online privacy is an illusion is much more interesting to me. We take risks whenever we put our private data in the hands of another person (online or offline). It’s important to understand those risks and make the decision about what you share and where you share it. I’m very active online, and I share quite a bit of information with people, but I think about what I want to share and what should remain private. I tend to be a fairly open person, so I keep very little information private, but anything that I want to remain private doesn’t get shared online. For example, I may let people know that I’m attending sxsw, but I probably won’t share the address of where I’m staying while I’m in Austin. However, your cousin who is also your friend on Facebook might decide to share the details of your wild party with grandma or decide to share pictures of your lovely knitted mittens with everyone they know. Or at some point a bug in Facebook’s code could expose your secret knitting habit or wild party pictures with the world. Or the executives at Facebook could decide that their service should have more public information. The knitting and the wild party were never really private, and realistically neither one of these examples is probably a big deal in the long run. Your grandmother will forgive you (and she might even relate if she attended a wild party or two in her younger days), and eventually your friends will stop making fun of your knitting hobby. The real problem is when people think their data is more private than it is. Even people operating under user names that aren’t personally identifiable can often be tracked down using IP address if someone really wanted to find out who they are. Those of us who work in technology and who understand the internals of how websites and the internet work have a much better understanding of how secure our information is and can better manage the risk. 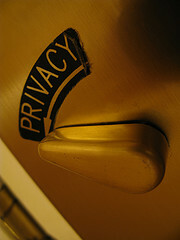 It’s up to us to help educate or less technologically-savvy friends and family about what privacy really means online. We each need to decide how much “private” information we share based on the risk of it becoming more public vs. the reward associated with sharing any particular type of information. Photo by Flickr user rpongsaj used under Creative Commons. This week there was yet another example of someone within a company talking about his company’s products on Facebook while posing as a consumer instead of disclosing his relationship with the company. In summary, don’t do this. It’s slimy, people will find out, and it reflects poorly on both the person and the company. I’ve talked about transparency and disclosure before on this blog, so I won’t go into details. In short, if you have a business relationship with a company that you are mentioning on any social media site, disclose it. An earlier Fast Wonder blog post with an introduction to Facebook for companies and organizations has been getting quite a bit of traffic lately, so I wanted to do a follow-up post with a few more details and updated information about Facebook. One of the reasons that I find Facebook so interesting is because it has a variety of features that are focused on community building and sharing information with friends and contacts. It is especially useful for smaller, lightweight community efforts. While we tend to think of Facebook as something for college students, recent college graduates, and technology early adopters, the reality is that Facebook users in the 35 and older category are growing at a very fast rate. 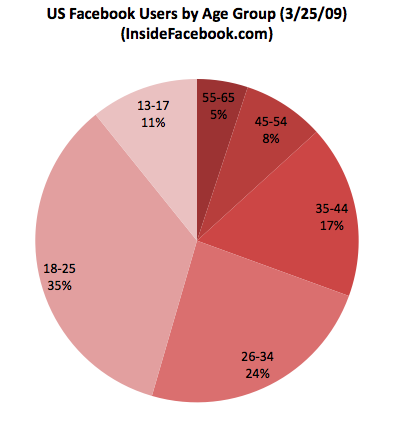 According to Inside Facebook, as of the end of March, 30% of Facebook users are over 35. There are several primary ways to participate on Facebook: personal profiles (private), pages (public), groups, and applications. Each one of these is used differently, so I’ll cover each one of them individually. If you haven’t already read my guiding principles post, you might want to read it first, since it talks more about acceptable behavior in social media. This is where you should start on Facebook, whether you are participating for fun or on behalf of a company. Facebook profiles are private by default – only the people that you add as contacts can view your personal profile, and they are designed to be used by individuals. You will use this as your account to log into Facebook, so you should work on building your personal profile before starting any other efforts on Facebook. This also gives you an opportunity to experiment with Facebook to learn what works for you and what doesn’t while participating as an individual, rather than jeopardizing your corporate brand image with costly mistakes and gaffes. Add a picture that helps people recognize you. 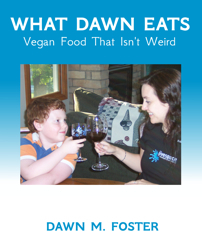 There are many other people named Dawn Foster, so it is important for people to be able to tell for certain that they are looking at your account instead of a stranger with a similar name. Post status updates and add a few extra pictures. Try to get a mix of personal and professional information to help people better understand the whole you with as much information as you feel comfortable sharing with people. Go easy on your friends – save the poking, zombie requests, etc. for close personal friends. Please do not create a personal profile for your company. These look weird and artificial, and they are designed to be private, which makes it difficult for people to interact with your company. We’ll talk about better ways to have a company presence on Facebook in the next section. Facebook pages are publicly viewable, which makes them much better for a corporate presence, since anyone can become a fan of your company without any additional interaction or approvals. People are effectively using pages for companies, products, bands, shows, special interest groups, and much more. Facebook pages have many of the same features as profile pages, but with information that is geared toward companies rather than individuals. While profile pages have education / work information and interests, public pages have location, hours of operation, company overview, mission, date founded, and more. Some features include: wall with messages, events, video, pictures, notes, and more. Powell’s Books has a pretty good example of a company page. Facebook also has a step-by-step guide and more information about creating a page for you company or product. Groups are usually used to share information, collaborate or organize around a specific topic, and they can be public or private depending on what you want to achieve from the group. Groups can be a way to create a very simple, lightweight community around an effort, especially if most of your audience is already on Facebook. People can become members by joining the group, and then they can post information to the group. The features are similar to the profiles and pages described above with information, wall / discussions, events, photos, links, video and more. Corvallis Beer and Blog is an example of how you can use a Facebook group to organize a weekly event. You might consider creating an application for your organization as a way for people to interact with your products. For example, companies like Nike and Intel have created Facebook applications. Be cautious when using applications. Some applications have been linked to viruses and others spam all of your contacts in order to use the application. However, there are some great uses of applications. I use the Twitter application to feed my Twitter status to Facebook, and I use the Upcoming application to display a list of events that I’m attending. As I mentioned earlier, go easy on your friends – save the applications used for poking, zombie requests, etc. for close personal friends, not business acquaintences. There are certainly other ways to use Facebook, but this covers the basic ways that most people use it. In general, remember to participate as a person first and a company second, and remember that the guiding principles that I have talked about so many times before on this blog still apply to using Facebook. Updated 4/7/09: I have a new, updated post about getting started with Facebook for your company or organization that you may want to read instead of this one. Facebook is probably the social network that has the broadest audience and the most community functionality of any of the big services right now. You can find large numbers of college students, people working in the technology industry, and many people in the 20 – 40 year old range; however, I am starting to see anecdotal evidence of some people in the older age ranges starting to join Facebook. There are several ways to engage with people on Facebook. Individuals. Make sure that some people in your company are on Facebook as individuals. This is the best way to learn how people use Facebook if you haven’t already used it. I would start by getting a personal account, entering your personal profile information, and friending a few people that you know. It’s a great way to learn more about how people use Facebook, and it will help you better understand how to use it for your company. Company page. After you are comfortable using Facebook as an individual, you should create a company page. Do not create a personal profile on Facebook for your company. Those look artificial and weird in addition to being outside of what people expect to see on Facebook. A company page lets you provide information about your company along with an event calendar, video, photos, discussion board, and much more. People can then choose to become “fans” of your company, and you can use this page as a lightweight community effort. Groups. You can create a group on Facebook around any imaginable topic. I’ve seen groups used fairly successfully for lightweight community activities, especially when they also involve an in person element. The Online Community Roundtable events in San Francisco are organized using a Facebook group. Applications. It might also make sense for your company to create an application that people can use on Facebook, but this would only be relevant to a small number of technology companies. The application could interface with your existing technologies the way that applications for Upcoming, Twitter, and others make it easy to update Facebook with information from those services. Another option is to make something purely for fun that people can use on Facebook. There are certainly other ways to use Facebook, but this covers the basic ways that most companies will want to use it. In general, remember to participate as a person first and a company second, and remember that the guiding principles that I have talked about so many times before on this blog still apply to using Facebook. 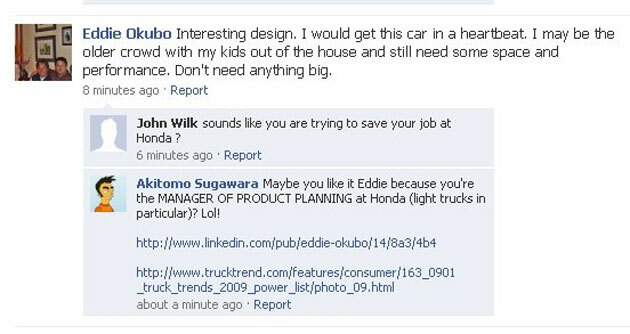 Please feel free to add comments with other ways that you like to see companies engage with people on Facebook. Facebook has been asked to pull the famous Scrabulous application from the site at the request of Hasbro and Mattel. While I am not surprised by this move, I am saddened by it. I love to play Scrabble on Facebook with friends in other locations that I rarely get the chance to hang out with in person. You can join the Save Scrabulous Facebook group to show your support. If Hasbro and Mattel were smart, they would be negotiating licensing deals and cross marketing arrangements with Rajat and Jayant Agarwalla (the makers of the Scrabulous application). I’ve heard more about Scrabble in the past few months as a result of the Scrabulous app, than ever before, so it is definitely generating buzz around the game. They should be focused on how to best use and build on this buzz to increase sales, instead of squashing something that could be really beneficial for them. This is yet another example of big companies not “getting it”. the inclusion of Joseph Smarr (Plaxo), Brad Fitzpatrick (Google) and Benjamin Ling (Facebook) to the DataPortability Workgroup. The non-participation of Google and Facebook, two companies that hold more user data and do more with it than almost any other consumer service on the market, was the biggest stumbling block to the viability of the project. These are two of the most important companies in recent history – what’s being decided now is whether they will be walled-garden, data-horders or truly open platforms tied into a larger ecosystem of innovation with respect for user rights and sensible policies about data. If these industry titans can put aside their rivalry and work together – magic could happen. Hopefully they can work appropriately with the other members of the working group, bleeding edge consultants and representatives of smaller and in many cases more user-centric companies. If so, perhaps we can move appropriately into a future of powerful personalization and logically augmented activity online – while avoiding Minority Report-style dystopian scenarios. Innovation on the internet is in its early, early days. The participation of representatives from Google and Facebook in this initiative could prove key in the continued development of what’s possible, instead of the early suffocation of what could have been. I have blogged here many times about the idea of online identity, but the potential for data portability that has been more of hope than a reality until now. I already use ClaimID as my primary OpenID provider. Ideally, I would love to manage my identity through an OpenID provider of my choice, but with more options to carry some of my data around the internet along with this identity. I hope to eventually be able to have a centrally managed picture, bio, profile information, and more that I can choose to share with online social networking sites (like Facebook) allowing me to maintain better control over my information and manage changes. Changing basic information (job change, phone number, etc.) can be a really labor intensive task for me. I remember going through this recently when I joined Jive in May. I would be willing to bet that you can still find old profiles on web 2.0 sites that still have me listed as working at Compiere or even Intel! Data portability is one of the biggest problems that web 2.0 companies and users face, and I have been following dataportability.org with interest, but a healthy amount of skepticism. With the addition of Google and Facebook, I have much more confidence that we will start to see this hope move closer to the reality of data portability over time. Jive has been focused for years on building our products using existing standards, and we are excited about what this might mean for Clearspace and other products. You can read Sam Lawrence’s perspective on this discussion and what it might mean to Jive over on the Jive Talks blog. A little social networking humor.